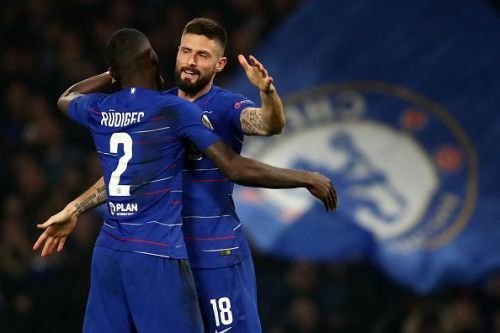 Three second-half goals from Olivier Giroud, Ross Barkley and Callum Hudson-Odoi ensured Chelsea progressed to the round-of-16 of the Europa League, as they secured a 5-1 aggregate over Malmo FF after they had ended the away fixture by 2-1. The Blues had a major share of the ball in the opening stages but brought their A game onto the deck only after Giroud netted the opener. Since then, there was no way back for Malmo, who never really looked like threatening Chelsea at their backyard. Chelsea registered their sixth consecutive Europa League victory. They have also scored 2.86 goals per game in Europe's second-tier competition, despite having suffered major setbacks in front of goal of late. More so, they received a major boost ahead of the all-important cup final against Manchester City at Wembley, on Sunday. Chelsea fans endured their happiest moment even before the game started when they saw the team sheets. Much to their delight, rather relief, Jorginho was replaced by Mateo Kovacic at the base of midfield. The World Cup finalist slotted in seamlessly in midfield and put in a fine shift. Only four players kept their place from the FA Cup defeat - Cesar Azpilicueta, Antonio Rudiger, N'Golo Kante and Kovacic. Elsewhere, Willian, who probably was the best player of the night, came in for Pedro down the right flank. The ever-so-willing Giroud reverted to the starting XI in place of Higuain, while Hazard received a much-needed rest, with Hudson-Odoi coming in. Emerson came in for Marcos Alonso, who has been heavily scrutinised for the defensive side of his game. 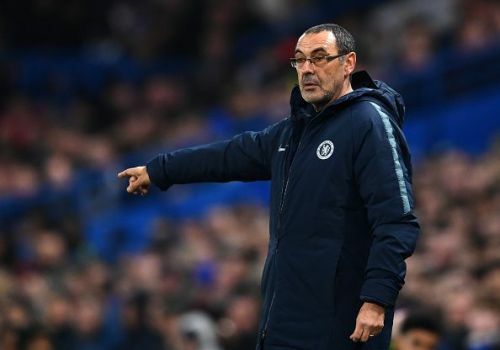 Chelsea fans were fairly happy, but not as much as they would have liked because most of them know Sarri will restore the criticized players against Manchester City, as this might have been a part of the rotation.